The MikroTik 8 Port 1 SFP Port Cloud Router Switch, with model code CRS109-8G-1S-2HnD-IN has eight Gigabit ports and one SFP port, it also has a built in Wireless Access Point. 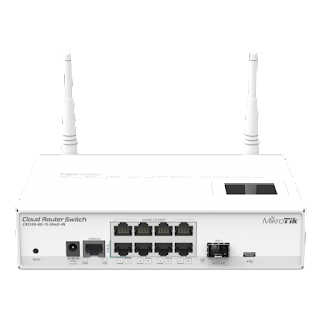 The MikroTik 8 Port 1 SFP Port Cloud Router Switch CRS series combines the best features of a fully functional router and a Layer 3 switch. MikroTik 8 Port 1 SFP Port Cloud Router Switch is powered by the familiar RouterOS. 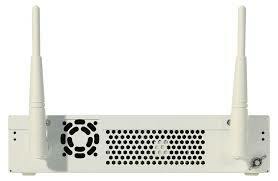 MikroTik 8 Port 1 SFP Port Cloud Router Switch, CRS109-8G-1S-2HnD-IN Technical Specifications. Qualcomm Atheros AR9344 600MHz CPU. 8x 10/100/1000 Mbit/s Gigabit Ethernet Ports with Auto-MDI/X.